Resin wood table tops are everywhere! This enviable look costs thousands to purchase, but is fairly easy to make yourself with some time, patience, special materials, and just a touch of building know-how. This easy DIY river table project calls for a reclaimed table base in a style that appeals to you. Using a pre-built base that you leave as-is or refinish to suit your taste takes lots of the work out of the process of building a resin top table. Let’s get started! This project begins with one table base of your choice. Choose a coffee table or a dining table, or go with a slim console table. 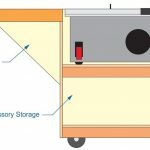 You may want to choose a smaller design for your first epoxy resin river table, so that you can familiarize yourself with the process before moving on to something a bit larger. It’s all up to you! We’re starting this DIY river table tutorial out with a few words of caution. First, be absolutely certain that you read all the literature that comes with the materials you’re working with. Choose compatible epoxy resin and hardener (you can buy these as a two-step kit for convenience) and make sure that it’s compatible with the tinting pigments you choose. Next, we want to stress the importance of choosing epoxy resin for this project. Do not use fiberglass resin, as it is flammable. Part of the process here involves popping bubbles with a torch or heat gun. If you try this with fiberglass resin, your project will catch on fire and this will burn down your shop or garage. Finally, be sure that you are working in a warm, dust-free environment. Anything else could cause this project to fail. Keep in mind, building a river table isn’t just construction. It’ an art project. Have fun with it! 1. Ensure all the bark has been removed from your live edge slabs, and be sure that both pieces are cut to the same length and sanded smooth. Ensure that you plan for the finished top to rest nicely on top of the base you have chosen. 2. Use mineral spirits to clean any remaining debris from the live edge slabs. 3. Build a box with plywood. This simple box will serve as a dam to contain your epoxy resin. You can determine dimensions by arranging your slabs as you plan to position them inside the dam, with their straight edges on the outside and their live edges on the inside for the desirable river table effect. Make the river space as wide or narrow as you like. 4. Lay the tarp or plastic sheeting down over your work area to provide protection from spills. Set the dam on the sawhorses or table. Check to ensure that it is level. Don’t skip this step! If your work area is not level, your table will have a slanted top. 5. Place your boards inside the dam to ensure that you like the fit. It should be snug, but not so tight that you can’t move the planks. Remove the planks from the dam. 6. Seal the dam’s joints with silicone and then line the interior of the dam with plastic shipping tape. 7. Place the planks back in the dam. It’s your last chance to make any adjustments to the way the planks line up with one another, so ensure that you’re happy with the way the layout looks. 8. You’re going to start mixing epoxy, but don’t prep your whole supply at once. Start with a small amount, following the manufacturer’s instructions. Do not add the pigment yet. 9. 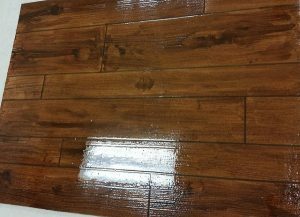 Brush a thin coating of clear epoxy onto the planks. 10. Add pigment to the epoxy remaining in the container. Mix more if you need to. You’re going to pour a ¼ inch layer into the river so try to gauge how much you’ll need. 11. After mixing pigment into the epoxy, pour the first layer of the river into the center area between the planks. Work slowly to avoid excess air bubble formation. 12. After the first river layer has been poured, use your heat gun to pop bubbles as they come to the surface. Be very careful with this process. Do not get too close to the epoxy, and don’t hold your heat gun next to any area for too long. Don’t use a hair dryer. Use a heat gun! You can watch an expert pop bubbles in resin to get an idea of how it works. 13. Let the epoxy dry before you begin with the next layer. You can wait overnight, or you can start the next layer when the epoxy develops a dry film on top. 14. Mix another batch of epoxy with pigment, adding another ¼ inch layer to the river. 15. Follow steps 12, 13, and 14 repeatedly until your river rises just above the live edges on the plank. You don’t want it to overflow, but you do want to have some extra material to sand off so that the finished project is perfectly even, without a hollow area in the middle section. Be patient and don’t hurry. Pouring too deep could cause the epoxy to bake, and this will ruin your project. 16. After the last river layer is complete, let the project cure for 72 hours or as long as the resin epoxy manufacturer recommends. Proper curing time is essential for strength. 17. Pop the river table out of its mold. You can simply unscrew the sides of the mold and remove them if this seems difficult. The tape should be easy to remove and the plywood underneath can continue to support your project while you finish completing the top. 18. Sand the entire top until the river line is level with the rest of the table. 19. Finish with 3 coats of varnish or a sheer wood oil finish like Odie’s oil. The drying time and finish details will vary depending on which products you opt to use. Be sure to follow the manufacturer’s instructions to the letter, and ensure that you choose products that are compatible with the epoxy resin you used for the river table. 20. When the table top is complete and dry, it’s ready to attach to the base. 21. Ensure that your base is clean, finished, and dry. 22. Select hardware that works with the table base and the top that you’ve chosen. Position the river table top on the base (be sure to get help if it’s large!) and double-check to ensure that you like the way it looks. Keep checking position as you fasten the base and top together. You may wish to use clamps for this step. If you do, be sure to protect your table top’s surface with a soft cloth, and don’t clamp any harder than is necessary to prevent movement. 23. That’s it! You’ve completed your very first DIY river table. Take photos, congratulate yourself, and enjoy showing it off. How Much Time Does It Take to Build a DIY River Table? It takes several days – often longer than a week – to complete this project. The active pouring process isn’t time consuming, but you’ll be spending plenty of time waiting between pours and then waiting for the final curing process to complete. Keep in mind that very thick, impressive slabs require far more time and epoxy than their thinner counterparts. What is the Average Cost to Build a River Table? Cost depends on the wood you use as well as the amount of epoxy resin you need. Expect to pay more than $50/gallon for high-quality epoxy resin. We encourage you to get the best you can afford for this project and avoid cheap products. Your handcrafted river table will be an amazing work of art when it’s complete! We can’t stress enough the importance of learning all about the materials used in this DIY epoxy resin river table before you get started. It’s best to start small when learning this technique. Once you’ve mastered it, you’ll be ready to move on to larger river tables that look even more impressive.